Russia 2018: Musa’s Strike Vs Iceland, 17 Others Nominated For Goal Of The Tournament – Royal Times of Nigeria. 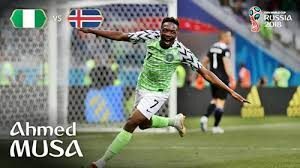 Ahmed Musa’s second goal for the Super Eagles in their two-nil win over Iceland at the 2018 FIFA World Cup in Russia has been nominated to view for the best goal of the tournament. 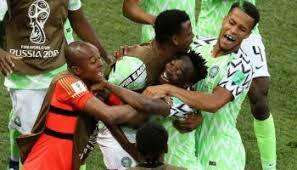 Musa bagged a brace in the encounter to hand Nigeria’s Super Eagles their only win at the tournament. The Leicester City forward’s strike will contend with 17 other goals scored at the tournament in a poll conducted by FIFA. Other goals nominated for the goal of the tournament award include, Cristiano Ronaldo’s third goal against Spain,Nacho’s strike against Portugal, Philipe Coutinho long range strike against Switzerland among others. Voting will continue on the official website of FIFA until Monday 23 July, according to the World football governing body.